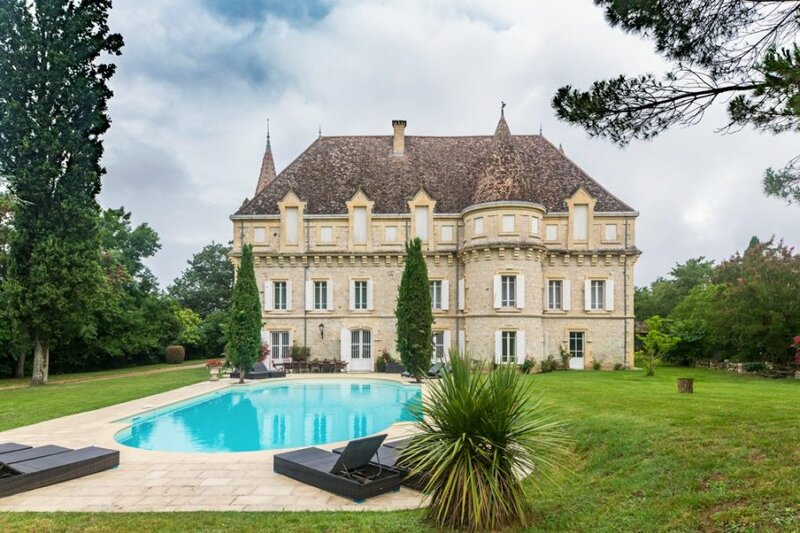 Chateau Quercy, a beautiful 19th century chateau in the Southern Quercy region of the Midi-Pyrenees, is the ideal spot for your large family holiday or special event. Chateau Quercy, a beautiful 19th century chateau in the Southern Quercy region of the Midi-Pyrenees, is the ideal spot for your large family holiday or special event. Having recently undergone extensive refurbishment, this chateau offers spacious accommodation in extensive fenced grounds with woodland walks through ancient cedars. Enjoy a billiards room, private 12x6m pool, fenced tennis court and terrace for outdoor dining. The chateau sleeps 19 in 8 bedrooms with traditional furniture and 6 stunning modern bathrooms, many en-suite. The expansive contemporary kitchen is fitted to a high standard, and the dining room's extendable table will seat 16 for your dinners together. The two salons include one with a TV/DVD player and another with a beautiful 17th century stone fireplace. The home's highlight is the first floor entertaining space with picture gallery and grand piano. This luxury chateau is only 1 km from a picturesque 13th century fortified village, where you can walk the stone arcades and visit a boulangerie and bar-restaurant. A short drive away, you'll find Moissac, which has lively weekend markets, a beautiful abbey and an extension of the Canal du Midi. Reach the chateau from the Toulouse (90 km) or Bergerac (100 km) airports. Please contact us to discuss the possibility of a small group discount. Good news! For al little extra, this property is available as a Vill'otelYey! Wait… what is that? On the ground floor is a beautiful modernised kitchen with dining room offering a breakfast table to seat 8, a modern gas-fired Lacanche kitchen range with double electric ovens, built-in steamer and plancha, central island with dishwasher, Liebherr fridge, freezer and wine cooler, and an extendable dining table with seating for 16 adults. The large sitting room that opens out to the terrace, garden and swimming pool, comes with satellite television with English and sport channels and DVD player. A separate living area beside the beautiful C17th stone fireplace leads from the dining room through to the terrace. At the base of the sweeping stone staircase, the Yellow salon has a large carved fireplace and offers access to the terrace and garden. The billiards room is furnished with a traditional French Billiards table. There are also two separate WCs on this floor. On the first floor is is the grand ‘couloir du chateau'. At over 26m long, it is offers a wonderful entertaining space and is decorated with chandeliers, a picture gallery, a grand piano for the music-minded and a stone Juliette balcony overlooking the sweep of the driveway for the romantics! There are 8 bedrooms (1 quad, 1 triple, 1 twin, 5 doubles) and 6 bathrooms. Additional beds can be added on request to a number of bedrooms. Within the chateau grounds is a large private garden with ancient cedars and a 12x6m swimming pool to the south, and a high-fenced hard tennis court to the rear. The terrace lends itself to outdoor dining in the summer, and the garden is ideal for entertaining on a larger scale. The grounds are extensive and mainly set over arable land, but woodland walks and beautiful views over the Seoune valley are all available. The property has care-takers living on site in a separate building in the grounds, however, your privacy is assured. In 2018, the old stables situated opposite the chateau will be available for guests use. This beautifully restored stone building has archways offering marvellous views over the grounds and the chateau. There are also two charcoal bbqs for you to enjoy the summer. The nearest airports are Toulouse (90km) and Bergerac (100km). The local village is just half a km away, with amenities such as bakery, bar and restaurant, whereas the nearest supermarket is 12km from the chateau. Moissac – with its 12th century cloisters and vibrant market during the weekends, situated on both the Route of Santiago de Compostela and the Canal du Midi et Deux Mers, Moissac offers a cultural and gastronomic experience to its visitors. Montcuq – renowned for its excellent Sunday morning market, and more recently for its Monopoly fame, this hill-top village is proud of its Cathar history and the Donjon is visible from miles around. With an international community at hand, the locals have become adept at speaking English!